Canadian Tire Jumpstart and the Canadian Paralympic Committee created the Parasport Jumpstart Fund to help get more kids across Canada involved in sport. The fund helps to support the costs of sports and recreational programs for children between the ages of four and 18, who are financially disadvantaged and living with a disability. Funds may be used towards registration, transportation and equipment costs for children within approved Parasport programs. For Track and Field clubs currently offering or looking to offer para athletics programs this represents a significant opportunity to cover the costs of acquiring equipment, including the purchase of racing wheelchairs; throwing frames and Run, Jump, Throw bags as well as funding to be able to provide transportation for participants and cover club fees for those who may otherwise not be able to afford to participate. If you require specific assistance and guidance in preparing an application you can contact your provincial/territorial branch association or Athletics Canada directly. Following this course, participants will have the knowledge, skills and RJT lesson plans ready for implementation in their community, school or organization. 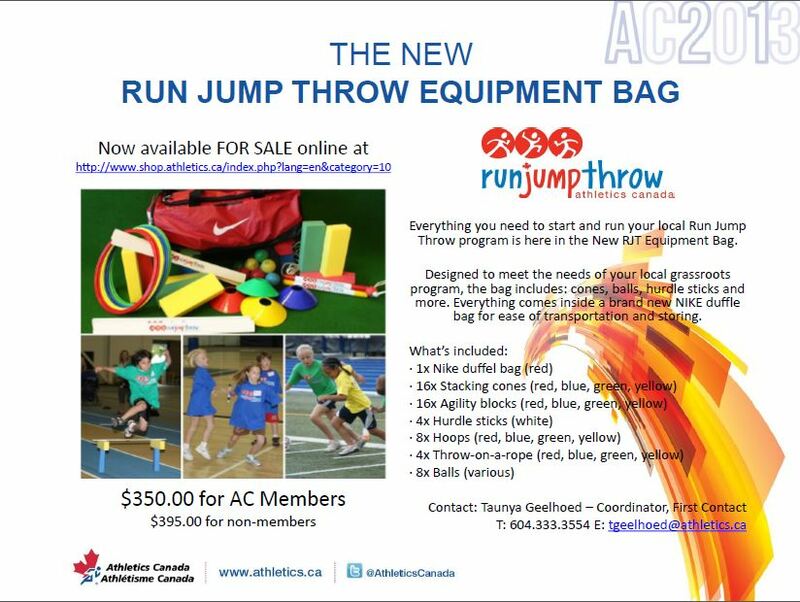 This course is being provided FREE to participants (who live in the PacificSport Interior Region) thanks to the 2011 Western Canada Games Legacy funding and PacificSport Interior BC. PacificSport Interior BC is hosting KIDZONE on Sunday during the Kamloops Indoor GranFondo & Family Festival. As part of KIDZONE, retired Hammer Thrower and PacificSport Interior BC Sport Performance Coordinator, Jennifer Joyce will be leading Run Jump Throw activities in the afternoon! Visit their Facebook page for more information! PacificSport will be hosting XploreSportZ Summer Camps in Parksville July 9 – 13th and in Nanaimo July 30 – Aug. 3rd and Girls Only Camp Aug. 13 – 17th from 9am – 4pm each day. Participants will sample a variety of sports including Run Jump Throw, Taekwondo, ultimate Frisbee, bounce ball, yoga, baseball and many more.